Sometimes you’ll find that when you double click on a document (for example a protein sequence) that it opens in the wrong application. Generally this has resulted from recently installing a new application that has registered itself as the default application that you normally use to open that document. This will overwrite your default application. 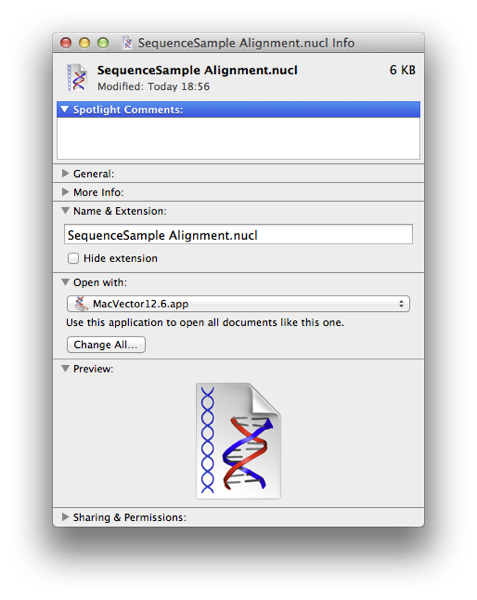 For example you double click on a Genbank sequence file (that has a file extension ending in “.gb”. You expect to see this sequence in MacVector, but instead it opens in some other application. 1 – select any of the file type you want to change (e.g the aforementioned Genbank file) and “get info” using CMD + “i” (or right click/hold down CTRL and left click, on the file and choose “get info”). 2 – in the Get Info dialog move to the OPEN WITH section (as in the screenshot below). 3 – Change the drop down menu to MacVector.app. 4 – Click the CHANGE ALL button and reply CONTINUE on the dialog that appears. Now close the Get info dialog and double click on a text file. It should now open in TextEdit. This entry was posted in Support, Tips and tagged OSX. Bookmark the permalink. Both comments and trackbacks are currently closed.